Once considered a symbol of fertility for the ancient Indians, mustard is one of the oldest known culinary and medicinal spices. 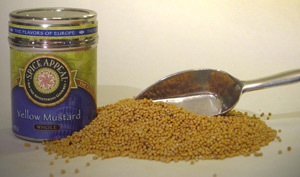 These large yellow seeds have a delicate flavor and light aroma making it the most mild type among the mustard seeds. Commonly used for preparing mustard pastes or condiments with wine vinegar and other spices. Used in pickled condiments for not only flavor enhancement, but for preservative qualities as well. Goes well with cold meats, sausages, grilled steak, poultry, fish, herbs, wine, garlic and sauerkraut.